The Mixquip’s new side entry agitator. MIXQUIP, the division of Teralba Industries that designs, manufactures and imports liquid mixing equipment, has expanded its range of side entry agitators with the release of the new Rummager. This innovative agitator can be moved from tank to tank, when full, without loss of product. The Mixquip Rummager can be used to mix any liquid filled vessel with a direct pass valve such as a ball valve. 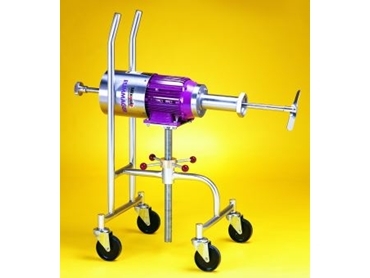 The Mixquip Rummager has a shaft which slides through the motor. The folding propeller moves through the ball valve and opens automatically when the agitator is started. All parts in contact with product are stainless steel. Teralba stock optional items including 51mm and 76mm stainless steel ball valves, BSM, Triclover and Flanged connections and an adjustable stainless steel mobile trolley for the larger models. The versatility of the new Mixquip Rummager means it can be utilised for mixing a wide variety of fluids, beverages and solutions in storage tanks up to 100,000 litres. Teralba Industries 02 4626 5000.